Inhalation injury is a common occupational hazard and may be because of smoke or chemical substances (fumes). Chemical inhalation is sometimes cause of severe respiratory distress and may even lead to Acute Respiratory Distress Syndrome (ARDS). Phosgene (carbonyl chloride; chemical formula COCl 2 ) has been widely used as a chemical warfare agent in the past, particularly in World War. Its exposure can occurs to the persons working in the manufacturing industries of aniline dyes, polycarbonate resins, coal tar, pesticides, isocyanides, polyurethane, and pharmaceuticals. Phosgene inhalation poses significant risk to workers who may be accidently exposed and may be life threatening; as is illustrated by the following case report. A 25 year old nonsmoker and non alcohalic male laborer suffered inhalation injury to phosgene gas after accidental leakage while working in a pesticide manufacturing factory. Immediately after exposure he experienced lacrimation, nausea, and dry cough with burning sensation in his mouth and throat. After six hours of exposure he developed breathlessness. The patient did not complain of chest pain, hemoptysis orthopnoea or Paroxysmal Nocturnal Dyspnoea. Initially he was admitted to the nearby hospital and managed conservatively. However within 24 hrs his condition worsened and he developed severe respiratory distress thus he was referred to our hospital, a tertiary care referral center for respiratory and intensive care. At the time of admission he was conscious and oriented to time place and person. He was febrile having temperature of 100 F, tachycardia of 130/min and tachyopnea of 36/min. using accessory muscle of respiration. His SpO2 was 80% without oxygen. On chest auscultation bilateral coarse crepitations were present. His cardiovascular and abdominal examination did not reveal any abnormality. His laboratory investigation revealed total leukocyte count 24000/cmm, with majority of polymorphs. His biochemical, renal and hepatic parameters were within normal limits. His X-ray chest was suggestive of bilateral hilar fluffy shadow characteristic batwing appearance [Figure 1]. He was given high flow oxygen therapy with face mask. After 30 minutes arterial blood gas analysis showed acidemia and hypoxia. Noninvasive ventilation was tried but within an hour shifted to invasive ventilatory support. Antibiotic therapy in the form of third generation cephalosporin was started prophylacticaly along with supportive therapy. He remained hemodynamic stable throughout ICU stay. His Endotracheal aspirate culture was sent immediately after intubation and after 48 hours of ventilatory support. Both the culture reports were sterile. He gradually improved with treatment and was successfully weaned off from ventilator on 6 th day of ICU stay. He was shifted to general ward on 8 th day and was discharged from the hospital on 10 th day. He regularly came in follow up every week and recovered completely after 6 weeks. Treatment is primarily supportive as there is no known antidote for phosgene. Any patient with a history and symptoms that suggest the possibility of phosgene exposure should be kept under observation for at least 24 hrs All severe cases benefit from close monitoring and oxygen therapy if oxygen saturation is below 90%. Role of corticosteroid both in nebulised as well as injectable form has been studied in various animal models and human cases. None of the form has shown advantage in the outcome of the patient. Few studies were conducted with use of N-acetyl cystiene, aminophylline, ibuprofen, pentoxyphylline and isoproterenol in animal models. They have shown that these agent are helpful in decreasing the development of pulmonary edema and inflammatory cascade but, human experiment are lacking. ,, Our patient did not received either corticosteroid or any of these agents. Though role of antibiotics in treatment is not understood and raised leukocyte count may be simple protective response of the bone marrow to the insult. Antibiotic therapy was given to the patient to prevent chances of secondary bacterial infection. Our patient responded with positive pressure ventilation and extubated within a week. However it took him around 45 days to recover to normal. The complete recovery after phosgene exposure may take a long time, and most patients continue to complain of exertional dyspnoea for several months after exposure. 1. Wyatt JP, Allister CA. Occupational phosgene poisoning: A case report and review. J Accid Emerg Med 1995;12:212-3. 2. Lim SC, Yang JY, Jang AS, Park YU, Kim YC, Choi IS, et al. 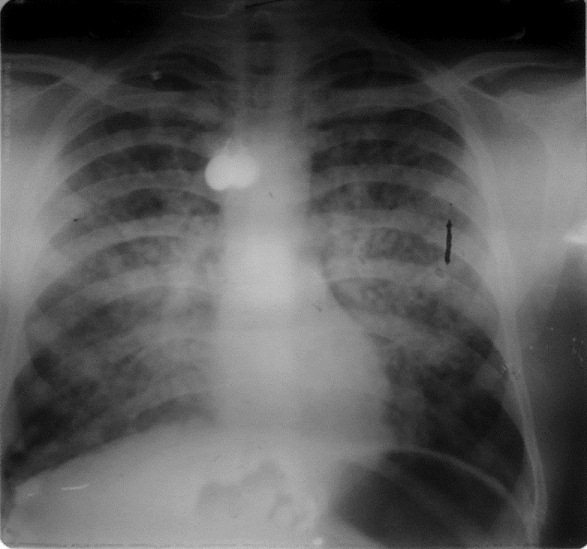 Acute Lung Injury after Phosgene inhalation. Korean J Intern Med 1996;11:87-92. 3. Regan RA. Review of clinical experience in handling phosgene exposure cases. Toxicol Ind Health 1985;1:69-72. 4. Diller WF. Pathogenesis of phosgene poisoning. Toxicol Ind Health 1985;1:7-15. 5. Diller WF. Early diagnosis of phosgene overexposure. Toxicol Ind Health 1985;1:73-80. 6. Duniho SM, Martin J, Forester JS, Cascio MB, Moran TS, Carpin LB, et al. Acute changes in lung histopathology and bronchoalveolar lavage parameters in mice exposed to the choking agent gas phosgene. Toxicol Pathol 2002;30:339-49. 7. Grainge C, Rice P. Management of phosgene-induced acute lung injury. Clin Toxicol 2010;48:497-508. 8. Sciuto AM, Hurt HH. Therapeutic treatments of phosgene-induced lung injury. Inhal Toxicol 2004;16:565-80. 9. Sciuto AM, Strickland PT, Kennedy TP, Gurtner GH. Protective effects of N-acetylcysteine treatment after phosgene exposure in rabbits . Am J Respir Crit Care Med 1995;151:768-72. 10. Sciuto AM, Stotts RR, Hurt HH. Efficacy of ibuprofen and pentoxifylline in the treatment of phosgene-induced acute lung injury . J Appl Toxicol 1996;16:381-4.